Have you ever wanted to capture the smoky fragrance of Lapsang Souchong black tea into something edible? Here is a delicious way to try it in an appetizer inspired by a recipe from Heidi Swanson’s cookbook Super Natural Cooking. Lapsang Souchong has a heady campfire aroma and provides an easy way to impart a wonderful smoked flavor to foods without having to go through all the hassle of actually firing up the smoker yourself. Here I use it to season a sauté of shiitake mushrooms and a bit of pulled pork packaged neatly in a spring roll wrapper. Feel free to substitute fillings with cooked shrimp or scallops or even tofu to name a few ideas. In place of Arbor Teas’ Organic Lapsang Souchong, you may also want to try their Organic Russian Caravan Black Tea. A blend of Chinese Keemun and Lapsang Souchong, it will have a less potent smoke factor. For the dipping sauce I created a rich plum butter flavored with an organic black tea mixed with bits of real vanilla bean pods (check out the recipe here). Please don’t be daunted by the recipe if making jam isn’t your thing. It’s only meant to inspire. Purchase your favorite jam, chutney or marmalade; the results will be equally good. Preheat oven to 400 ° F.
Crush tea leaves to a fine powder in an electric coffee grinder or spice grinder. In a large skillet, heat sesame oil over medium-high heat. Add onions, garlic, and mushrooms and sauté for about 5 minutes (or until mushrooms soften). Stir in shredded pork, carrot, chard and shoyu. Mix gently until evenly distributed. Tasting as you go, add ground lapsang souchong a teaspoon at a time until reaching desired smoked flavor. Remove from heat. To assemble spring rolls, place a wrapper on flat workspace with one corner of the wrapper pointing towards you. Keep additional wrappers covered with a damp towel. Add 1-2 tablespoons of filling just off center closer to the corner closest to you. Fold this corner over the filling and then roll wrapper tightly one turn away from you. Fold in the corners from ends at the right and left, then continue to roll the wrap toward the remaining corner. Seal flap by dabbing with a bit of water. Place seam-side down on a baking sheet and repeat with additional rolls. Brush assembled rolls with melted butter and bake for 10-15 minutes, turning each roll over halfway through baking, until golden and crisp. Serve hot accompanied with dipping sauce. 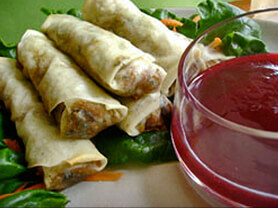 To make the dipping sauce, place the plum butter and rice wine vinegar in a small bowl, whisking to combine.